We’d love your help. Let us know what’s wrong with this preview of Is That Wise, Pig? by Jan Thomas. Cow and Pig are helping Mouse make a delicious soup, but Pig keeps trying to add ingredients that don’t make sense! Mouse is making a yummy pot of soup and Cow and Pig are helping add ingredients. Mouse adds four tomatoes, Cow adds five potatoes, and Pig adds…six galoshes?! Is that wise, Pig? Young readers will be so busy giggling at Pig’s antics, they won’t even realize th Cow and Pig are helping Mouse make a delicious soup, but Pig keeps trying to add ingredients that don’t make sense! To ask other readers questions about Is That Wise, Pig?, please sign up. Be the first to ask a question about Is That Wise, Pig? Thomas, Jan Is That Wise, Pig? PICTURE BOOK. Beach Lane (Simon), 2016. $15. Mouse is making soup and Cow and Pig are ready to help. While Cow seems to know what makes a good soup, Pig thinks things like umbrellas and galoshes are also useful. While they might not make good soup, those things do have a use after Pig makes one last unwise choice. Thomas is another favorite illustrator/author of mine. She continues to delight me and create fun frolics to share and share again. You could do an entire Thomas, Jan Is That Wise, Pig? PICTURE BOOK. Beach Lane (Simon), 2016. $15. Thomas is another favorite illustrator/author of mine. She continues to delight me and create fun frolics to share and share again. You could do an entire story time with a stack of Thomas! Pre-K – ESSENTIAL. Cindy, Library Teacher. reminds me so much of Happy Birthday, Cow! A silly animal tries to help with a task but doesn't quite get what helping entails; in the end though, Pig is totally vindicated. The humor of both Pig's silly suggestions and the end result are what make this (and most of Jan Thomas's books) a wonderful read. I can't recommend these books enough and will definitely be sharing with as many toddlers and preschoolers as I can find. I love her books! They are great for Toddler and PreK story classes. And my kids at home who are in grades K and 2 can read them on their own aloud. (the Kdg with assistance). * One note. 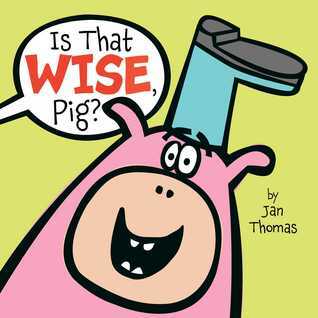 I don't think the young readers will automatically understand the question "Is that wise, Pig?" so I would say that but then add "Do you think that is a good idea, Pig." I was so happy to see Jan Thomas published another book. Keep them coming!!! Another stellar picture book from Jan Thomas. 3 animals are making soup (practicing counting) and pig keeps trying to put weird things in it (umbrellas, boots, etc). Mouse and Cow stop him and Pig eventually helps make delicious soup and they're all about to eat it when his 10 hungry pig friends show up. I love the use of critical thinking "Is that wise, pig? ", and counting! Mouse, Pig, and cow are back in this laugh-out-loud funny concept book. With simple text and Jan Thomas' signature bright colors, Mouse makes a pot of soup and his friends help....or do they? Pig has some interesting ideas about the ingredients that should be added. Together the friends count all the way to 10...but the reader may be laughing too loud to hear all of the numbers! Cow, Pig, and Mouse are making soup, but Pig suggests some strange ingredients like umbrellas and galoshes to mix with Cow and Mouse's vegetables. A refrain asks Pig to consider his suggestions and prompts little listeners to chime in with the correct response. Funny, practical and paced just right, this is a great read aloud for toddlers and PreK with vibrant digital illustrations. What a fun, cute story. Going to follow up Thomas's Doghouse book with this one to see if the littles will notice the same characters. Yay, a new non-seasonal Jan Thomas! This one stands up to the others and is very good. So cute and funny. For me, this was laugh out loud funny! I loved the illustrations, and I love the counting concept. Redbud nominee. Hilarious! I think this will be voted into the top few. I love Jan Thomas so much. Yes, yes, yes for storytime! It's always a wise idea to read Jan Thomas books! Jan Thomas, crushing it once again! Clever as always from Jan Thomas! Looking for something quick & silly? Jan Thomas' books are sure to hit the mark! Here, some friends decide to make a soup and each brings some ingredients to add, but Pig doesn't seem to get the concept. When mouse asks pig if he wants to help make soup, he gets much more than he bargained for as pig brings one unconventional ingredient after another to the pot. This silly tale, with bright and colorful illustrations, had my son asking me to read it over and over again. 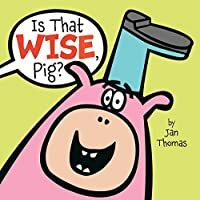 “Is That Wise Pig” is both counting book and storybook with a repeated refrain that gives pre-readers ample opportunities to join in with with the story telling and engage with the text. Since my son is obsessed with numbers the When mouse asks pig if he wants to help make soup, he gets much more than he bargained for as pig brings one unconventional ingredient after another to the pot. This silly tale, with bright and colorful illustrations, had my son asking me to read it over and over again. “Is That Wise Pig” is both counting book and storybook with a repeated refrain that gives pre-readers ample opportunities to join in with with the story telling and engage with the text. Since my son is obsessed with numbers the counting helped him focus in on the book, but wasn’t so distracting that he couldn’t also enjoy the story. At its heart, this is a story about accepting your friends, even if they are a bit quirky and their actions may not make sense to you at first. This is definitely one we are looking to add to our home shelves soon. This book is called Is that WISE, Pig? It is written and illustrated by Jan Thomas, and is sooo funny! I found myself laughing out loud as friends Cow, Pig, and Mouse work together to make a delicious soup, but Pig keeps trying to add ingredients that don’t make sense! Mouse is making a yummy pot of soup. His friends Cow and Pig are helping add ingredients. Mouse adds four tomatoes, Cow adds five potatoes, and Pig adds…six galoshes?! Is that WISE, Pig? Pig has some silly ideas about what should go in the soup! Young readers will be so busy giggling at Pig’s antics, they won’t even realize they are counting, too. A twist ending and irresistible characters will make this a favorite read-aloud. Another fun book from Jan Thomas. In this one, Pig keeps wanting to add weird stuff to the soup and his friends ask "Is that wise, Pig?" Well, adding umbrellas or galoshes to the soup isn't wise alright, but in the end, it turns out to have been a wise choice after all. Like another reviewer said, "it's wise to read Jan Thomas' books!" They're fun and colorful and so accessible to beginning readers, they crack me up every time. This takes the "Stone Soup" and "Little Red Hen" stories up a few notches and is good for a few laughs to boot! Pun intended. Mouse inducts pig and cow as eager volunteers in preparing soup. Ingredients are added in numerical increments, such as one onion, two cabbages, three umbrellas, wait, what? Be sure and point out to your beginning reader the punctuation marks so they can get a grasp of what they are for and better yet, properly dramatize their reading. Lives in Socorro, New Mexico. Trivia About Is That Wise, Pig?